June 10, 2015 - Today, Green Business Certification Inc. (GBCI) launched its newly acquired SITES rating system, the most comprehensive program and toolkit for developing sustainable landscapes. SITES was developed through a collaborative, interdisciplinary effort of the American Society of Landscape Architects, The Lady Bird Johnson Wildflower Center at The University of Texas at Austin, and the United States Botanic Garden. The rating system can be applied to development projects located on sites with or without buildings - ranging from national parks to corporate campuses, streetscapes and homes, and much more. Landscapes knit together the fabric of our communities, said Rick Fedrizzi, CEO, GBCI. "And sustainable landscapes are critical in their ability to reduce water demand, filter and reduce storm water runoff, provide wildlife habitat, reduce energy consumption, improve air quality, improve human health, and increase outdoor recreation opportunities. SITES is an important addition to our toolkit, and GBCI appreciates this opportunity to support this additional contribution to healthy, thriving communities and neighborhoods." "It is exciting to see years of work to develop and field test SITES culminate in the availability of this rating system," said Fritz Steiner, FASLA, dean of the School of Architecture at The University of Texas at Austin. "The depth and breadth of approaches implemented by pilot projects demonstrates how valuable SITES can become for revolutionizing our relationships with built landscapes." "Landscape architects and members of all the related design and planning fields know that the issues addressed in SITES are increasingly important to creating livable and resilient communities," said Nancy C. Somerville, executive vice president and CEO of the American Society of Landscape Architects (ASLA). "GBCI will take SITES to the next level and ensure its future growth and influence, and ASLA is pleased to provide continued education and communications support." "SITES is a powerful tool for enhancing built landscapes precisely because it puts ecosystem services, the benefits humans derive from functional ecosystems, front and center," said Ari Novy, executive director of the United States Botanic Garden. "This approach will help maximize our collective ability to create sustainable and healthy communities. Making SITES available through GBCI will be a great boon for the quality and resilience of our built landscapes." The SITES rating system uses progressive industry standards for landscape design and incorporates additional recommendations from technical experts in the fields of soil science, botany and horticulture, hydrology, materials, and human health and well-being. Some of the credits for sustainable landscape performance have been developed in alignment with similar credits in the U.S. Green Building Council's LEED (Leadership in Energy and Environmental Design) rating system, the world's most widely used green building program. 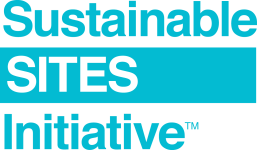 SITES, originally modeled after LEED, includes best practices in landscape architecture, ecological restoration and related fields, and knowledge gained through peer-reviewed literature, case-study precedents and projects registered in the SITES pilot program. "Adding SITES to GBCI's rapidly growing list of certification systems and credentials it supports not only expands GBCI's capabilities, but it also helps us to further our mission to enact global sustainable change," said Mahesh Ramanujam, President, GBCI. Interested project teams can visit www.sustainablesites.org for more information and to register their projects and access the SITES v2: Rating System For Sustainable Land Design and Development: a guide that provides best practices, performance benchmarks and tools for creating ecologically resilient landscapes, and rewards successful projects through certification. The Wildflower Center and ASLA will help GBCI create and implement SITES credentialing and certification offerings such as training project reviewers, and will provide educational opportunities for pursuing SITES certification.